Color resin statuette of Pinocchio talking to Jiminy Cricket perched on his shoe. Today, I spent most of my time browsing through the online auction catalogue of the Michael Jackson Neverland sale. One item that tickled my fancy was the Pinocchio Statuette above. I fell in love with it. In a nasty Paul McCarthy kind of way. For further research, I watched the Living with Michael Jackson documentary from a few years back by that (awful) “journalist”. And what can I see, sitting on one of the tables: Pinocchio! But what I really was looking for was the moment when Michael Jackson goes shopping in Las Vegas. One of the best moments ever captured by TV cameras, minus the stupid “journalist” commentary, who is only asking about the prices. Boring! Anyway, here it is. Jump to 4:00 minutes, where the fun begins. “Journalist”: Do you think it is a bit tacky? Michael Jackson: Tacky, are you silly? I felt very tempted to put all pictures from the online auction catalog of the Michael Jackson Neverland auction in this post. There are so many great items to be had, for instance “an electric cart featuring an image of Jackson as Peter Pan on the bonnet and Peter Pan cushions.” I’d love to drive around with that all day. “A robotic Michael Jackson head featured at the climax of his 1988 film Moonwalker, when he transforms into a robot and defeats Joe Pesci’s evil character, Mr Big.” And it still animates! Honestly, I love every item. Want it. Need it. This is the game I have been waiting for since I got the iPhone: Touch Pets Dogs. I’m very happy that a Jack Russell is among the selections, cause that’s what I’ll be getting, just like MARIAH! 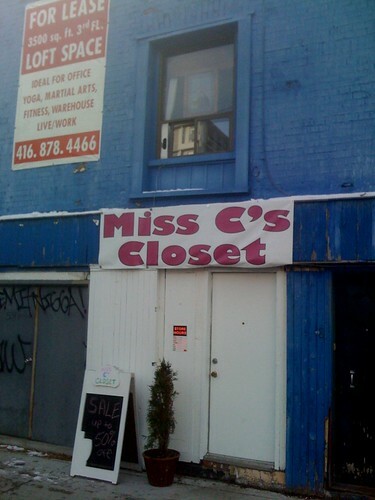 Yesterday, Mary and me went to Miss C’s Closet, a new drag store in an back alley near Yonge and Wellesley. Not only looked the store great from the outside, we just had a very pleaseuarble shopping experience. Highly recommended. With our bags stuffed, we hailed and cab and drove to the Powerplant to see a performance by Ei Arakawa. He used Scott Lyall’s exhibition as his set, two pictures below.